Start Meatless Mondays — this is a great way to eat a variety of colors and textures in your diets. Start a family garden — you’ll eat what you grow and get more exercise too! See these helpful tips on starting a family garden or a community garden. Say yes to produce — Make sure every plate (at breakfast, lunch, and dinner!) includes at least one portion of fruit or vegetable. Challenge yourself to make it a different fruit or vegetable three times a week! For snacking make sure that fruits and veggies rule, by choosing and including these first. Cut down on sugar — Replace sugary desserts with whole fruit or mixed, chopped fruits. Heat up frozen cherries with cocoa powder or a few mini chocolate chips. If you still want to indulge, top a small scoop of ice cream with fresh berries, chopped nuts and/or a variety of chopped, fresh fruit! Make healthy substitutions when baking! 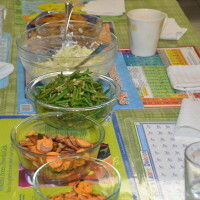 « Hello MyPlate Goodbye Pyramid! Confused about recent claims about the health benefits of coconut oil. You, too?